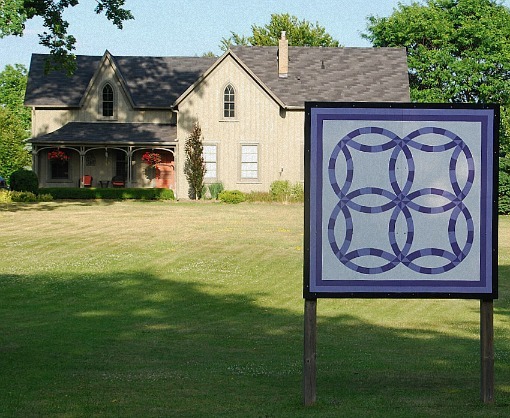 There is a barn quilt tour in southwestern Ontario that I periodically remember about, and last week I found one in a lovely village called Mt Pleasant. stands in front of the Bryning Manse (c1840). Reverend John Bryning was the first resident Presbyterian minister in the Village of Mount Pleasant. The Manse is the only remaining board and batten building in Mount Pleasant and is the oldest surviving house in the community. It is a restrained one-and-a-half-storey structure, in the Regency-Gothic style, which was appropriate for a Presbyterian manse, in a rural pioneer community. 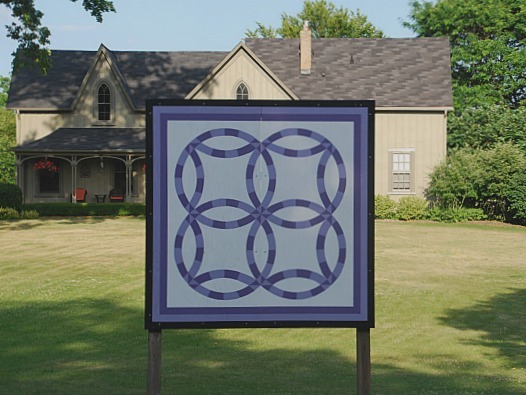 The double wedding ring pattern was chosen for this location in honour of all the weddings the Reverend performed in the village. I always loved this design in a quilt. Just beautiful. I think this is a perennial favourite! Lovely! (Both quilt and house). I was glad the late evening sun didn't cast too much of a shadow on the quilt board, at least! Beautiful and I love the "violet" color. it's a favourite colour of mine, too. The Manse is a beautiful old building. Here in Launceston, Tasmania we have a place called Mt Pleasant Laboratories. The suburb it's in is Prospect so I don't know what connection to Mt Pleasant it has as the Mountain is quite a long way south of here. There's no actual mountain here. There were some nice rolling hills, though. Gothic style is one of my favorites, we have only a few in this area. Barn quilt tours are popular these days. Thanks so much fir joining in this week. I'd sure like to see more of your treasures. It is, isn't it? simple, yet complex. My mom made me one of those except in many colors. It is priceless to me. I like that style house. I had a small quilt with this pattern many years ago. It has since been passed on. Hmmm! I made a double wedding ring quilt for my mother. They are so pretty!